Wide receivers had a pretty tough go of it in fantasy last season. That's probably why 12-team PPR mock drafters are taking nine running backs to only three receivers in the first round. And yet the wide receiver position is still potentially one of the most important pieces of your PPR fantasy team. So if you find yourself taking a lot of running backs in the early rounds, don't feel like you are doing something wrong. What separates a champion from a .500 team, is to find those mid to late round players that will be gems for you at some point in that season. In this article, we hope to point a few of those sleepers out to you. Of course there are many more, but here are a few to take a look at. 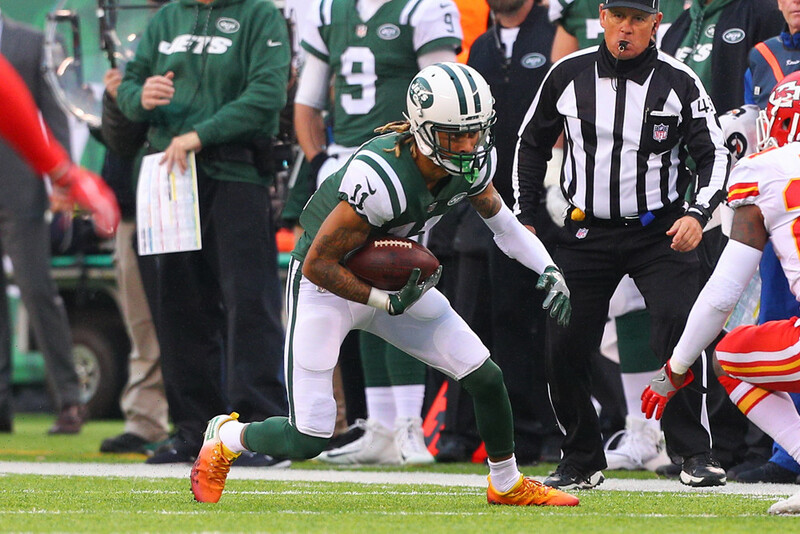 Robby Anderson broke out in 2017, catching 63 passes on 114 targets for 941 yards and seven touchdowns. He averaged just around 7 targets a game, which is not bad for a mid-round receiver. Anderson is currently being drafted late in the eighth round (8.10), and he is the 39th overall wide receiver off the board. Anderson is on this list because many fantasy owners don't know what to think of him. He was arrested (again) in the offseason and may face a short suspension from the NFL. He also may have rookie quarterback Sam Darnold throwing passes to him, so his play could be a bit more sporadic. That being said, there is a reason why the Jets have stuck by Anderson through all the arrests. They must see that he is a great athlete and wide receiver. The Jets will probably be playing from behind a lot, so look for them to throw a ton. Anderson will fall in drafts if he is suspended, which makes him an even bigger sleeper in my book. Kelvin Benjamin is the most known wide receiver on this list, but has seemingly fallen off the radar over the last few seasons. Benjamin was traded mid-season in 2017 from the Carolina Panthers to the Buffalo Bills. Benjamin had a few decent games before being shipped off to Buffalo, but never really regained any momentum after the move. He finished 2017 with 48 catches on 78 targets for 692 yards and only three touchdowns. The Bills are a completely different team this year. They lost quarterback Tyrod Taylor. They lost a few offensive line pieces. They may lose running back LeSean McCoy forever if his allegations are true. So how can this be good for Benjamin? First, the Bills lost their rushing quarterback. Rookie Josh Allen seems to be more of a throw-first quarterback than a scrambler, so that right there will give Benjamin a boost. Add that with the fact that the run game itself will be a bit worse this year, the Bills may have to pass more often. Benjamin is currently being drafted as the 48th wide receiver, going late in the tenth round of 12-team PPR drafts (10.11). As a #1 receiver for a more pass heavy Bills' offense, Benjamin may be a steal at his ADP. Geronimo Allison has been around for a few years, but really hasn't had much of an impact in fantasy football. In 2017 he was targeted 39 times, catching 23 of them for 253 yards and no touchdowns. All of that may change this year. Aaron Rodgers is healthy, and he already has sustained two 1000 yard receivers in previous seasons. He has done it with Randall Cobb/Jordy Nelson, and did it again with Jordy and Davante Adams. But now Nelson is gone, and Cobb has been quiet, or injured the last few seasons. Allison is a tall (6'3) target, who seemed to have gained Rodgers' trust early last season. Allison did have a six catch, 122 yard outing against Cincinnati before Rodgers went down. Allison is currently being drafted in the middle of round 12 (12.05). He is the 54th receiver off the board. If he can take over that #2 wide receiver role in Green Bay, he will easily outperform his ADP. Of the three, Allison has the deepest sleeper appeal.